Think it might be time for a new ruggedized Pentax? It looks like the company agrees — two new models are making their debut this week at CP+. The first is actually a rebranded WG-1, now called the WG-10, which will be available exclusively at Target stores and the website beginning in April. It’s identical to the WG-1, save for the obligatory red finish and a $180 price tag. The second model is more of an original number — it’s an update to last year’s WG-2. The new compact, dubbed the WG-3, maintains the unique design of the other two Optios, including a nifty LED ring around the lens for lighting macro shots. There’s a 16-megapixel, 1/2.3-inch BSI CMOS sensor, a 3-inch 460k-dot LCD, a 4x lens with an f/2 wide-angle maximum aperture, along with options for 1080/30p and 720/60p video capture. It’s waterproof to 14 meters (46 feet), shockproof to 2 meters (6.5 feet) and freeze-proof to -10 degrees Celsius (14 degrees Fahrenheit). The basic version will run you $300, while a tricked-out $350 model adds GPS and Qi wireless charging, along with a secondary LCD that displays the current time, barometric pressure, a compass, altitude and underwater depth. Snag a peek in the gallery below. Denver, CO (January 29, 2013)- Leveraging its long-standing and comprehensive expertise in the waterproof category, PENTAX RICOH IMAGING AMERICAS CORPORATION (PENTAX) has introduced the 15th generation in its adventureproof line-up of point and shoot cameras, the WG-3. Boasting a diverse set of new features and improved specifications, the WG-3 is the ideal companion to capture life’s planned and unplanned adventures. The WG-3 boasts a rich feature-set that has been optimized to meet the rigorous and demanding needs of the adventurous photo enthusiast, whose travels and exploits can take them into a variety of scenarios too challenging for the traditional point-and-shoot. Its newly designed, large-aperture, 4x optical zoom lens (with the maximum aperture of F2.0 at wide-angle end), high-sensitivity, back-illuminated 16 megapixel CMOS image sensor, and sensor-shift Shake Reduction system ensure sharp, high-quality, low-noise images. The rugged features of the WG-3 include an improved waterproof depth rating to 45 feet, while the WG-3 GPS offers enhanced GPS functionality for geo-tagging images that can be mapped back to your journey and a dedicated second display showing compass direction, elevation or depth below water. Additionally, the WG-3’s category defining Digital Microscope mode and six LED lights surrounding the lens barrel enable focusing as close as one centimeter from the subject producing bright, shadow-free macro images. For the unplanned adventure, the WG-3 offers a worry-free shooting experience with an increasingly ruggedized body that is shockproof from drops of up to 6.6 feet, coldproof to 14 degrees Fahrenheit and crushproof, withstanding up to 220 foot pounds of force. The WG-3’s rugged design is enhanced by its folded optical zoom lens that reduces its vulnerability to moisture and dust while ensuring a compact and pocketable size without the protrusion of a lens barrel. Finally, the sturdy construction and sharp design, unique to the WG-3, features a texturized grip for a controlled ergonomic grasp and colorful grip accents to further enrich its rugged styling. Denver, CO (January 29, 2013) – PENTAX RICOH IMAGING AMERICAS CORPORATION (PENTAX) has today announced the availability of the compact and highly portable WG-10 adventureproof point and shoot camera, an ideal option for the on-the-go shooter who requires a capable yet sturdy image and video capturing device. 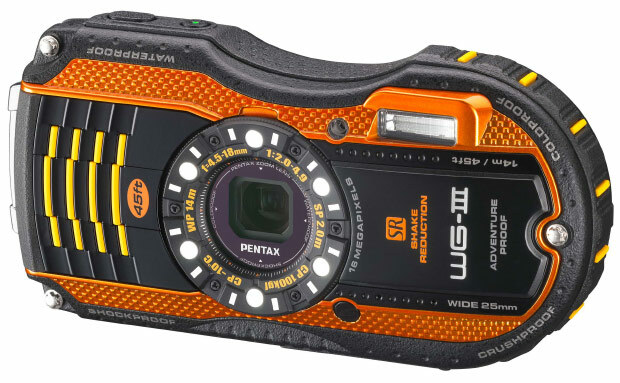 Its durable assembly and robust feature-set makes the WG-10 the ideal companion camera for life’s explorers; striking the perfect balance between a point and shoot and PENTAX’s category defining adventure-ready features. Waterproof to depths of 33 feet, the WG-10 can withstand the rough-and-tumble lifestyle of an active shooter. The WG-10 bridges the gap between the common point and shoot and life’s more challenging photo opportunities that might require waterproofing or the ability to function in a very cold environment; like a trip to the waterpark or an impromptu snowball fight. The WG-10 offers a 14 megapixel backlit CMOS image sensor and a state-of-the-art imaging processing engine assuring rich and detailed imagery. Within its compact body, the WG-10 also features a 5X optical zoom lens with coverage from 5mm to 25mm (equivalent to approx. 28mm wide angle to approx. 140mm medium telephoto in the 35mm format). This versatile zoom lens comes in handy for a wide variety of scenes and subjects, from wide-angle snapshots, to telephoto images. Additionally, the WG-10 features PENTAX’s category defining LED Macro lights coupled and Digital Microscope mode enabling focusing as close as one centimeter from the subject producing shadow-free, evenly-lit images. The WG-10 will be available in mid-April in red for $179.95. Decades ago, NASA would frequently light up the night sky with chemical trails as part of its measurements of upper atmosphere behavior. While those moments are increasingly rare, we’ll get a rare chance to enjoy one of them this evening. 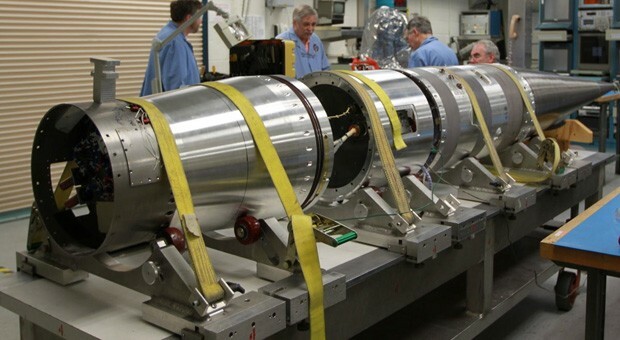 The agency’s Wallops Flight Facility in Virginia is launching a suborbital rocket that will generate (and test) a pair of trails of red-tinted lithium as it flies above Eastern US coastline — trails bright enough that large parts of the seaboard may get a first-hand look as the rocket gains altitude. If you fall outside of that range, don’t fret. NASA will stream the whole affair starting from 4:30PM Eastern, with a hoped-for takeoff over an hour later. Catch the feed below when the launch is live, and hit the source links for more about the mission itself. It’s still the same old story, really. Amazon pulls in revenues equal to a small nation’s GDP and makes a small profit for itself in the process. In this case, particularly small. Jeff Bezos’ little company that could has posted fourth-quarter turnover of $21.27 billion, a 22 percent increase, but a net profit of $97 million that’s down 45 percent from a year earlier. The discrepancy is attributed to a shift in reading habits that Bezos claims the company was expecting. Kindle downloads have been growing quickly, but old-fashioned paper book sales grew just 5 percent in December — the lowest in company history, Bezos says. That’s not surprising when you look at Amazon’s bestseller charts, as the Kindle Fire HD and three other Kindle devices led the ranks. Most of the concern centers on the future. Amazon expects its operating income to dip from $405 million to anywhere between a $285 million loss and a $65 million profit, which doesn’t exactly set a high bar for post-holiday performance. 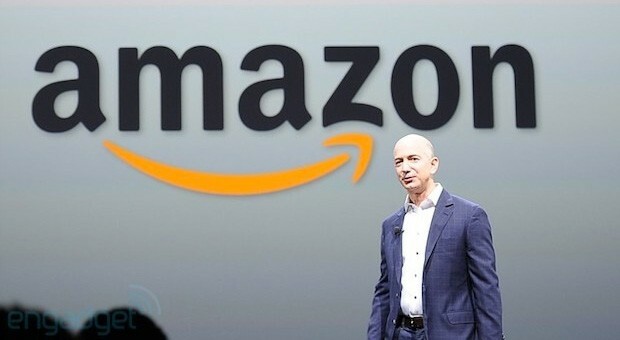 SEATTLE, Jan 29, 2013 (BUSINESS WIRE) — Amazon.com, Inc. AMZN +11.16% today announced financial results for its fourth quarter ended December 31, 2012. — For the second year in a row, Amazon’s tablet was the most popular item for customers – Kindle Fire HD continued its run as the #1 best-selling, most gifted, and most wished for product across the millions of items available on Amazon worldwide. At year-end, Kindle Fire HD, Kindle Fire, Kindle Paperwhite and Kindle held the top four spots on the Amazon worldwide best seller charts since launch. — Amazon announced the launch of AutoRip, a new service that gives customers free MP3 versions of CDs they purchase from Amazon. Additionally, customers who have purchased AutoRip CDs at any time since Amazon first opened its Music Store in 1998 will find MP3 versions of those albums in their Cloud Player libraries – also automatically and for free. — Amazon introduced Kindle FreeTime Unlimited, bringing together for the first time all of the types of content kids and parents love – books, games, educational apps, movies and TV shows – into one simple, unlimited, easy-to-use service for kids ages 3-8. — Amazon’s digital media selection has grown to over 23 million movies, TV shows, songs, magazines, books, audiobooks, and popular apps and games in 2012, an increase from 19 million at year-end 2011. — Amazon.com announced new licensing agreements with Turner Broadcasting, Warner Bros. Domestic Television Distribution, and A+E Networks, for popular television series including Falling Skies, The Closer, Pawn Stars, Storage Wars, and Dance Moms, expanding its catalog of title offerings for Prime Instant Video to more than 36,000 movies and television episodes. — Amazon launched Kindle Stores for Brazil, Canada, China, and Japan, with a large selection of the most popular books, including thousands of local-language books. — Amazon announced that 23 KDP authors each sold over 250,000 copies of their books in 2012, and that over 500 KDP Select books have reached the top 100 Kindle best seller lists around the world. — Amazon announced that for the eighth consecutive year, the company ranks #1 in customer satisfaction during the holiday shopping season according to the ForeSee annual Holiday E-Retail Satisfaction Index. ForeSee surveyed over 24,000 customers between Thanksgiving and Christmas, asking them to rate their satisfaction with the top 100 retailers. For the second year in a row, Amazon’s score of 88 is the highest ever attained by any retailer in the study. — Amazon Web Services (AWS) announced the launch of its newest Asia Pacific Region in Sydney, Australia, now available for multiple services including Amazon Elastic Compute Cloud (EC2), Amazon Simple Storage Service (S3), and Amazon Relational Database Service (RDS). Sydney joins Singapore and Tokyo as the third Region in Asia Pacific and the ninth Region worldwide. — AWS announced that SAP Business Suite is now certified to run on the AWS cloud platform. Enterprises running SAP Business Suite can now leverage the on-demand, pay as you go AWS platform to support thousands of concurrent users in production without making costly capital expenditures for their underlying infrastructure. AWS also announced that SAP HANA, SAP’s in-memory database and platform, is certified to run on AWS and is available for purchase via AWS Marketplace. — AWS continued its rapid pace of innovation by launching 159 new services and features in 2012. This is nearly double the services and features launched in 2011. — AWS has lowered prices 24 times since it launched in 2006, including 10 price reductions in 2012. — Net sales are expected to be between $15.0 billion and $16.6 billion, or to grow between 14% and 26% compared with first quarter 2012. — Operating income (loss) is expected to be between $(285) million and $65 million, compared to $192 million in the prior year period. — This guidance includes approximately $285 million for stock-based compensation and amortization of intangible assets, and it assumes, among other things, that no additional business acquisitions or investments are concluded and that there are no further revisions to stock-based compensation estimates. A conference call will be webcast live today at 2 p.m. PT/5 p.m. ET, and will be available for at least three months at www.amazon.com/ir . This call will contain forward-looking statements and other material information regarding the Company’s financial and operating results. This entry was posted on January 29, 2013, 5:31 pm and is filed under Mobility. You can follow any responses to this entry through RSS 2.0. Both comments and pings are currently closed.